Greek PM Alexis Tsipras will meet German Chancellor Angela Merkel “in due time,” a Cabinet member said, adding that Tsipras has a very busy schedule and plans to meet with the leaders of Italy and France first. “Tsipras has a very busy schedule at the moment with the upcoming meetings with head of the Italian government Matteo Renzi, the President of France, Francois Hollande and the Greek parliament,” the Minister of State for Greece, Nikos Pappas, told the television channel Mega. Chancellor Merkel says she has rejected the prospect of giving the new Greek government any debt relief, which could lead to a rising in tensions between Athens and its international creditors. "There has already been voluntary debt forgiveness by private creditors, banks have already slashed billions from Greece's debt," Merkel said in an interview with the Hamburger Abendblatt newspaper published on Saturday. "I do not envisage fresh debt cancelation," she said. "Europe will continue to show its solidarity with Greece, as with other countries hard hit by the crisis, if these countries carry out reforms and cost-saving measures," Merkel added. Tsipras made a statement to try to calm fears, saying that Greece will repay its debts to the European Central Bank and the International Monetary Fund and would also look to reach a deal with the Eurozone nations that helped bailout the country in 2010. “My obligation to respect the clear mandate of the Greek people with respect to ending the policies of austerity and returning to a growth agenda, in no way entails that we will not fulfill our loan obligations to the ECB or the IMF,” Tsipras said, which was reported by Bloomberg. Greece still has a debt of more than €317 billion ($357 billion), more than 175 percent of the country’s gross domestic product, which is a record for the European Union. This equates to a debt of €34,000 ($38,300) per person, while the average wage in the country is only €1,200 ($1350). Athens wants to renegotiate the terms of a €240 billion ($269 billion) bailout and says it will look to halve this debt. The Greek finance minister, Yanis Varoufakis, will meet with his French counterpart, Michel Sapin, on Sunday in Paris, according to the French Finance Ministry, Reuters reported. However, France has not shown any sign either of giving Greece any debt relief. Markus Gerber, an economics professor, told RT that it is essential that Greece is not able to blackmail the Eurozone and get its demands met, as this could open the way to other countries to follow suit. “The proposals are neither legal or legitimate. They are not legal because Greece as a member of the European Union is bound to respect contracts and treaties. Greece has only survived due to a great gesture of generosity and solidarity by all members of the Eurozone. It is not legitimate because Greece has not made any effort to reform the country,” Gerber said. Greece has already said it will not continue negotiations with the Troika group, which has been responsible the monitoring the Greek economy since it received the bailout money. Varoufakis also mentioned that Syriza would not be going back on its election promise by asking for an extension to its bailout program. "This platform enabled us to win the confidence of the Greek people," Varoufakis told reporters after his meeting with Jeroen Dijsselbloem, who is the head of the Troika group. "Our first action as a government will not be to reject the rationale of questioning this program through a request to extend it," Reuters reported. Felix Moreno de la Cova, an economist, told RT that he agrees with Syriza that something has to be done and there needs to be some restructuring. However, he added that the Greek government can only do this if they are willing to balance the books. 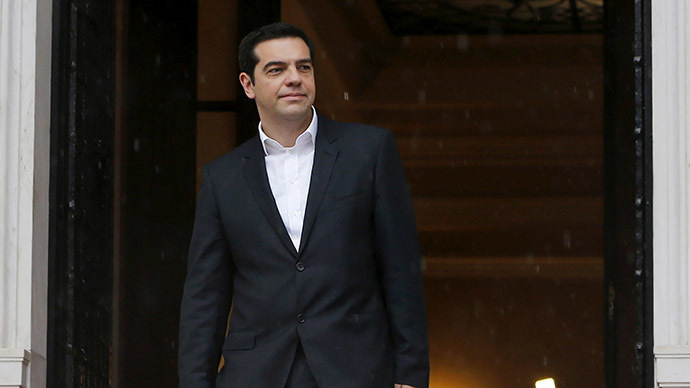 “I think Syriza has the will and the political capital to break with the European Union and to leave the Euro. I hope this does not happen as this will be bad for Europe and for Greece, but they are willing to take it that far. The positions in Brussels have changed and in Germany, they are actually willing to let that happen,” the economist said.